TTS is the leading community and platform bringing together key representatives of all crucial stakeholder groups in the entire value chain involved in bringing world-class translational biotech and health research to patients and markets. 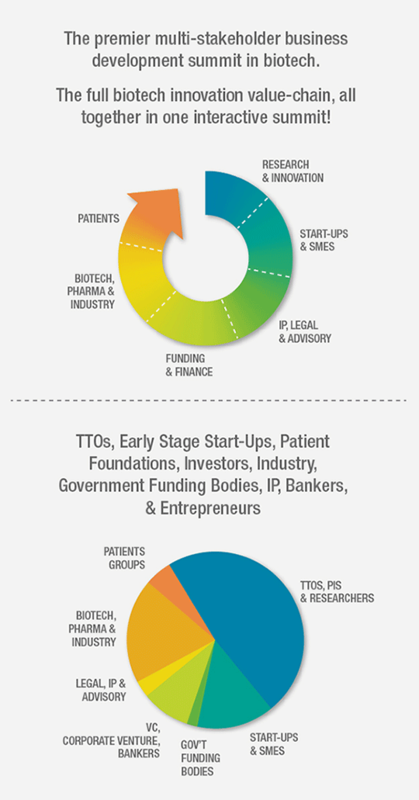 Active across North America, Europe, Latin America and Australia, the TTS is a unique global initiative and a powerful global network of leaders in the biotech, healthcare and life sciences innovation ecosystems. Full and customisable access to the TTS Summits in 2016. The TTS Summits are the backbone of the TTS Global Initiative. High-level, interactive round-table expert summits each bringing together a select group of some 200-250 healthcare innovation leaders to share and debate best practices, challenges and opportunities in a unique, open format at each of: TTS North America, TTS Europe, TTS Australia and TTS Latin America. The TTS Summits are exclusive to members or by invitation and are renowned as the pre-eminent platforms for deliberation over the real challenges, paradigm shifts and opportunities in our sector. Fundamentally, the TTS Summits provide ideal access, collaboration, investment and business development opportunities with all of the stakeholder groups crucial to moving innovation from the lab to the patient and market, in an open and interactive format unlike other meetings. Membership fees provide access to all TTS activities including four (4) registrations to the TTS Summits of your choice. The decision over which summits to attend is left to the member to determine based on their own current objectives and priorities. Members receive a quarterly e-magazine, entitled Invest in Biotech, which focuses on relevant issues, challenges, opportunities and developments, all in the TTS style. See (link to page for e-mag). Members may be featured e.g., highlight hot technological innovation by profile, interview or editorial (subject to agreement, and relevance of content, with the editor). Members may be invited to ad hoc, invitation-only TTS working groups to debate key issues and generate findings, recommendations, best practices and policy white papers to help ensure that innovation policy is focused where it will have the most impact. All members will receive the white papers and other outputs. Membership is open early stage start-ups and SMEs, University, Institute and Clinic Technology/Innovation Office directors, PIs, researchers and clinicians, VCs, patient organizations, foundations and NGOs, and other qualified stakeholders. Note: Pharma per se, large biotech, industry, legal, consulting and professional services are not eligible to join as members but are invited to become TTS Global Initiative Partners. Annual all-access TTS Global Initiative Institutional Membership Rate: Eligible members may join at a rate of GBP £1500 per year. Note this equivalent to approximately €1800 or US $2000 as posting on 31 July, 2016. For more information or to join the TTS Global Initiative, simply email christian@ttsglobalinitiative.com.